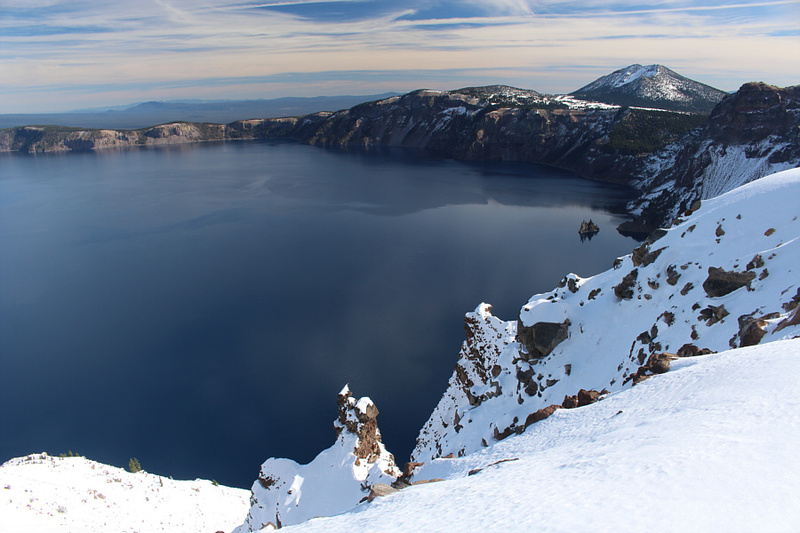 On 15 October 2017, Zosia Zgolak and I had plans to hike up Mount Scott, the highest point in Oregon's Crater Lake National Park. When we arrived at the park's south entrance though, we were dismayed to learn that the access road (Rim Drive) for Mount Scott was already closed for the season. 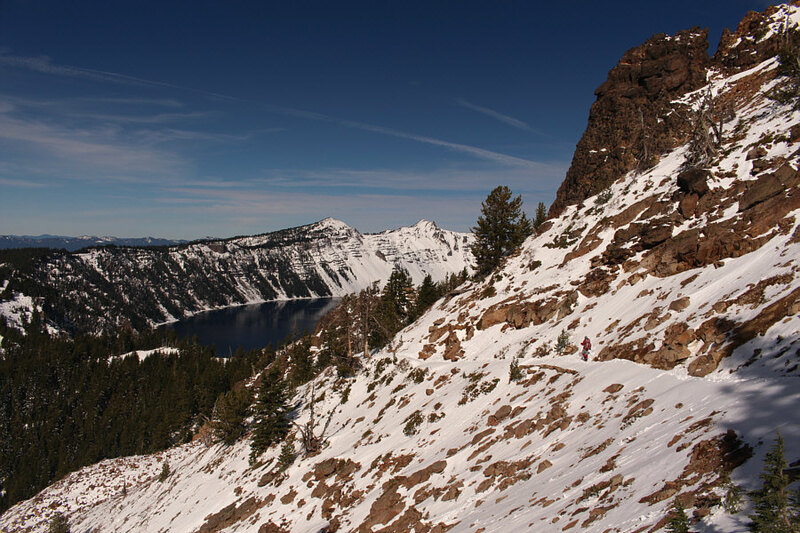 Thankfully, we were still able to drive to Crater Lake Lodge, and we settled for a shorter hike up nearby Garfield Peak. Despite an abundance of snow in the area, the peak had already seen a lot of foot traffic as evidenced by the well-broken trail all the way to the top. Other than a few slippery sections, we had no issues both going up and coming down. 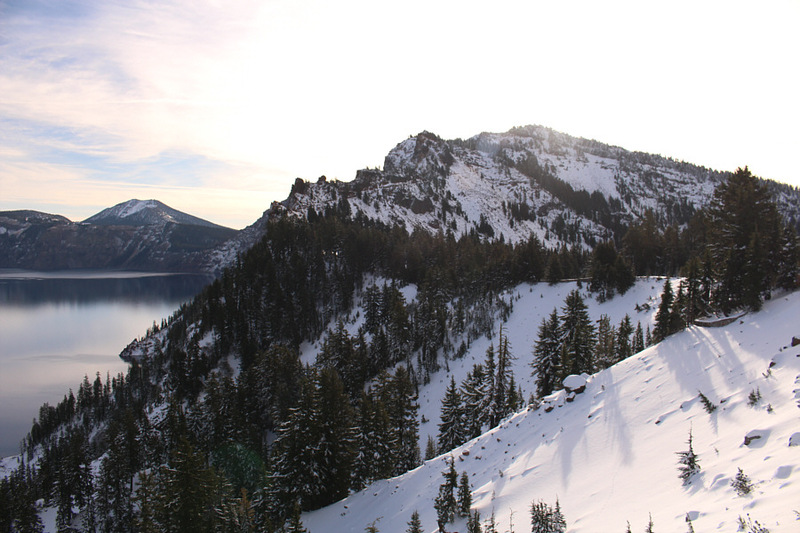 To be frank, the views from the top of Garfield Peak hardly improve on what can already be seen from the established viewpoints near the lodge, but it was nice to tag a named summit anyway. As we were leaving, we noticed that the western half of Rim Drive had opened up, and as such, we were able to exit the park to the north. 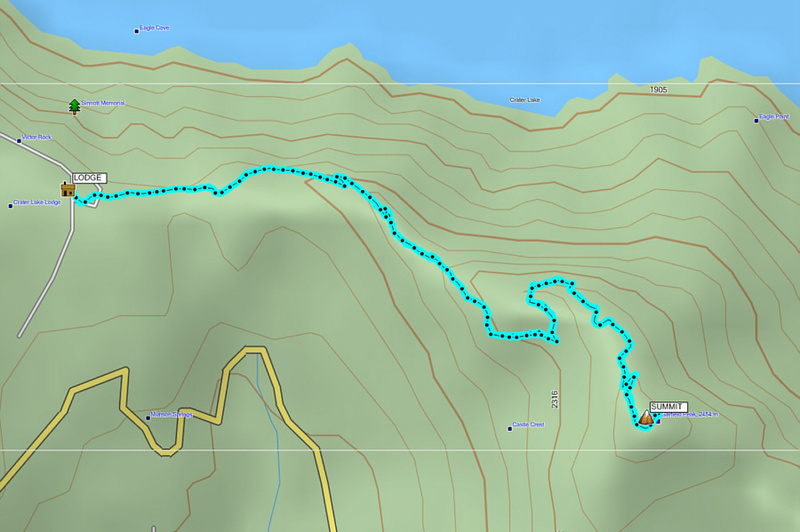 I hope to come back in the future for another crack at Mount Scott and maybe some other peaks in the area. 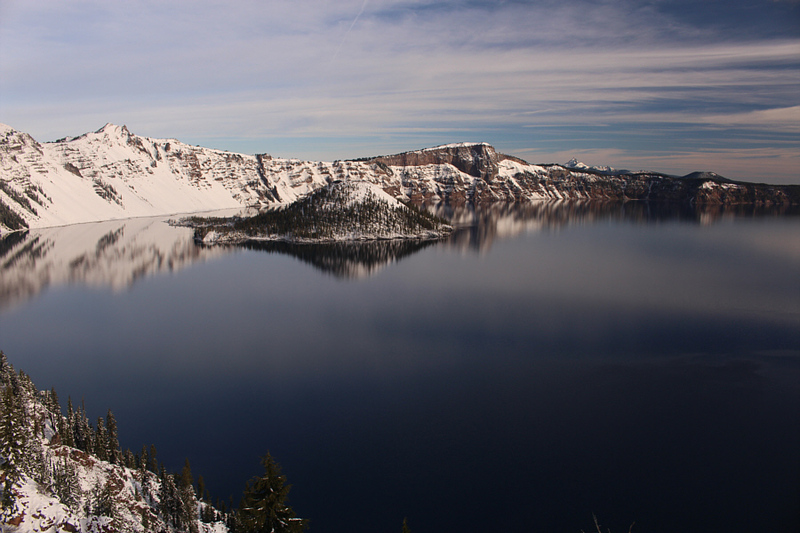 Certainly, the beauty of Crater Lake itself alone is worth a return trip. 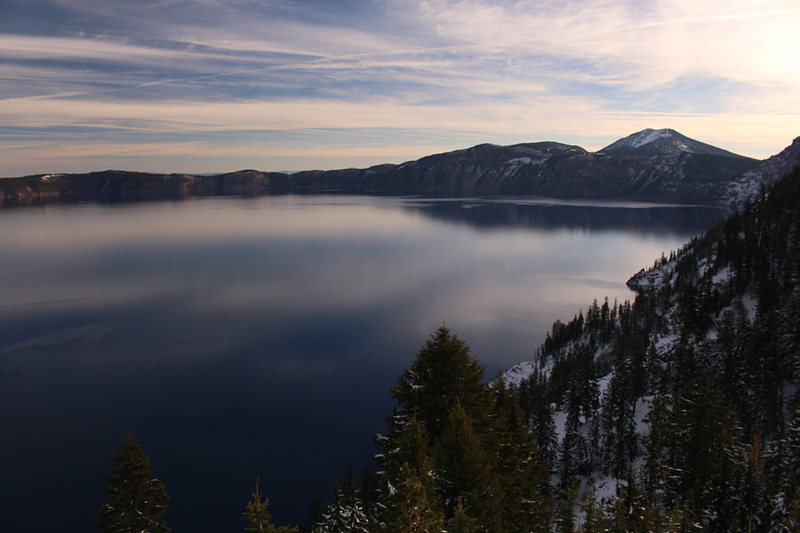 Views of Crater Lake are stunning from virtually anywhere along the crater rim. Mount Scott (far right) is the highest point in the park. 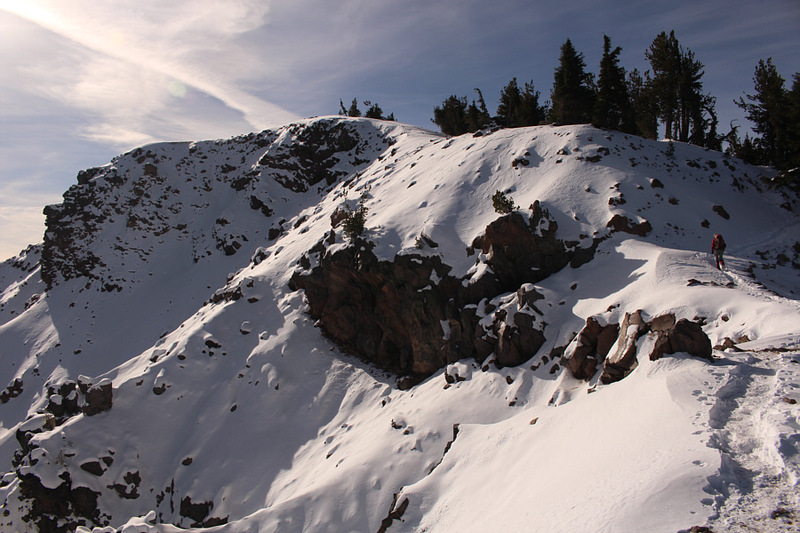 A trail can be seen running to the top of Garfield Peak. 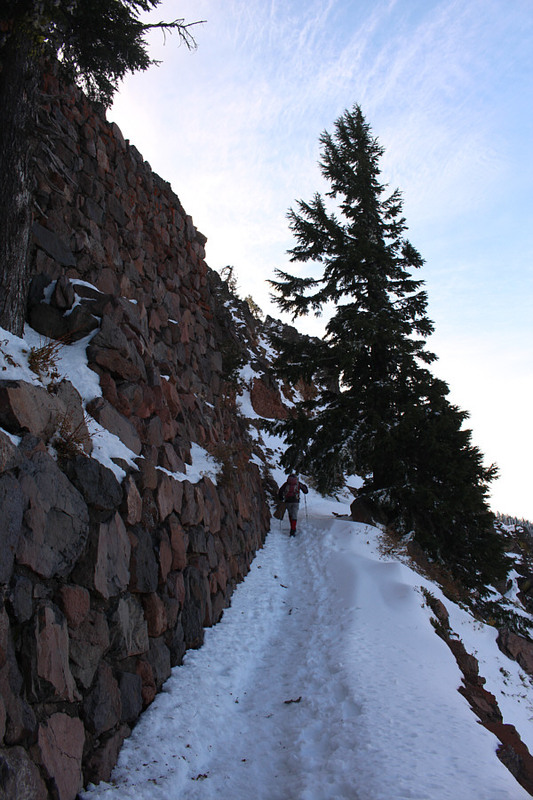 Zosia follows a beaten path through the snow on the trail. 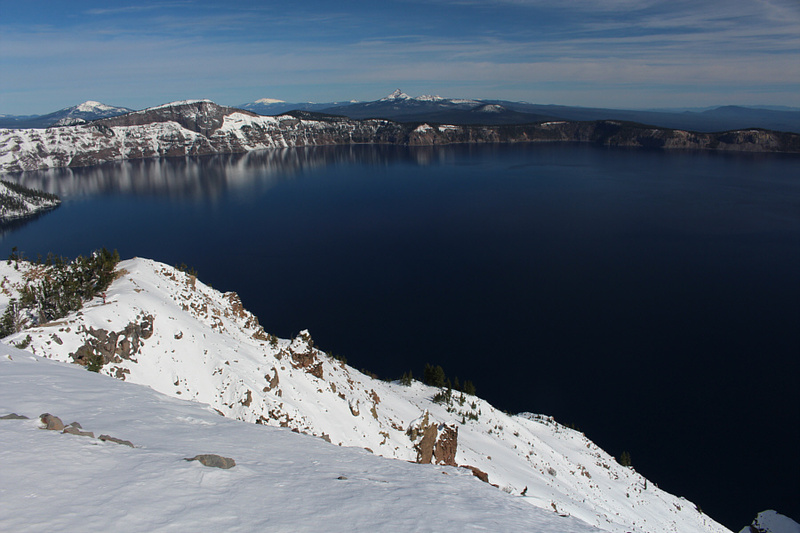 From the trail, there are already views to the south of Union Peak (right) and Mount McLoughlin. Zosia hikes along the crater rim. The striking peak on the left horizon is Mount Thielsen. Zosia approaches the summit block of Garfield Peak. 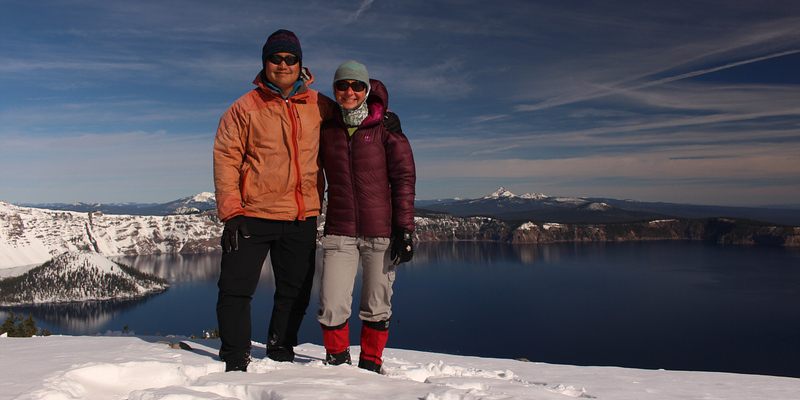 Sonny and Zosia stand atop Garfield Peak (2453 metres). 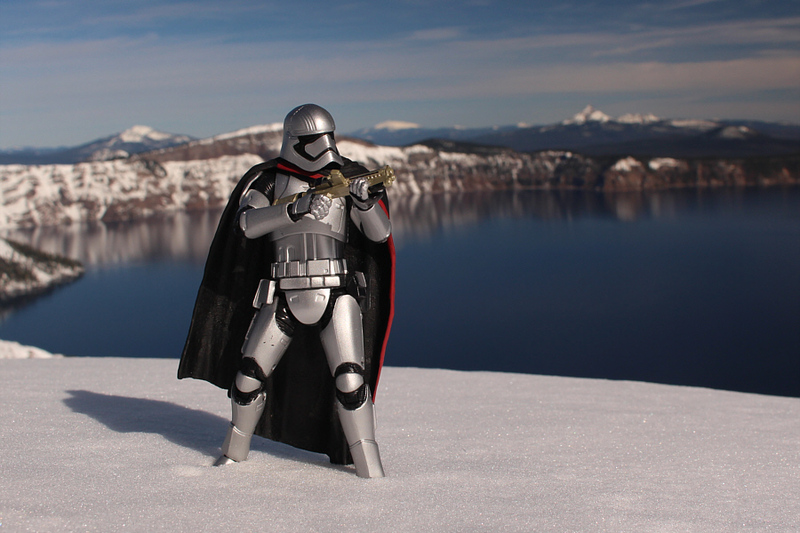 At left, The Watchman and Hillman Peak guard the western rim above Wizard Island. The high point on the far side of the lake at left is Llao Rock. 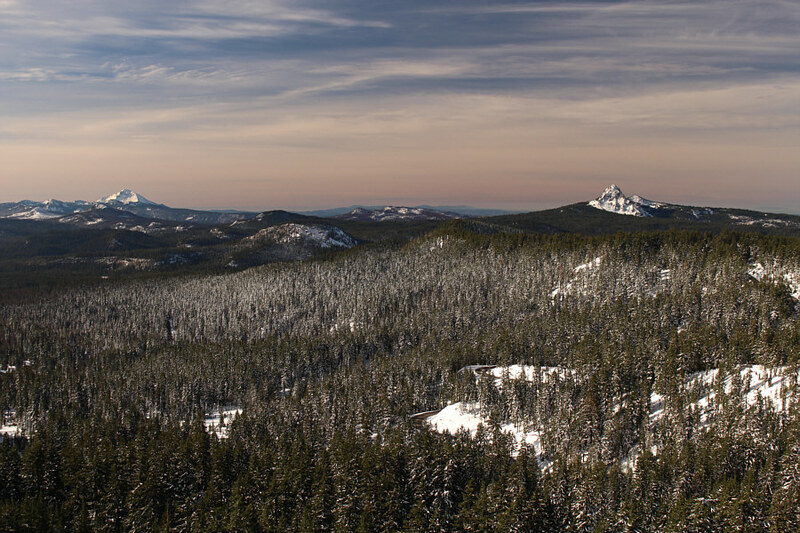 Noteworthy peaks in the distance include Mount Bailey (left of Llao Rock), Diamond Peak (white-capped mountain on horizon ) and Mount Thielsen (pointy one at centre). 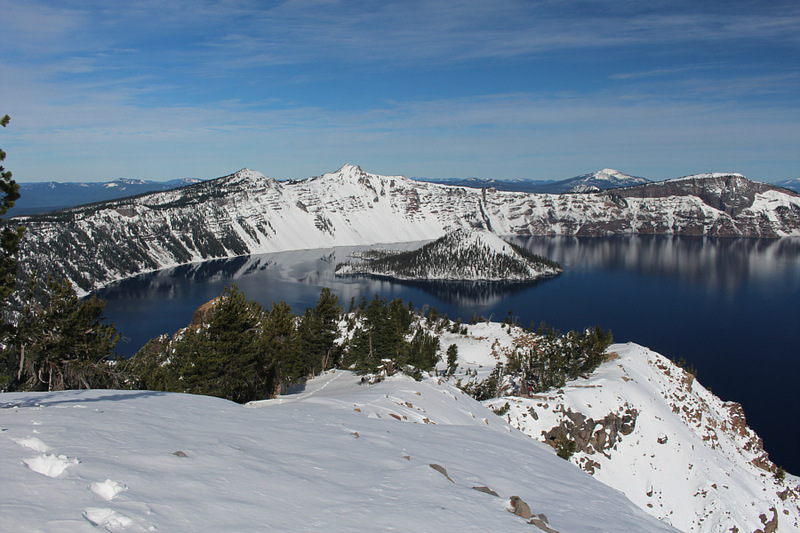 Here is another view of Mount Scott which rises to the east of Crater Lake. Also visible is Phantom Ship Island. 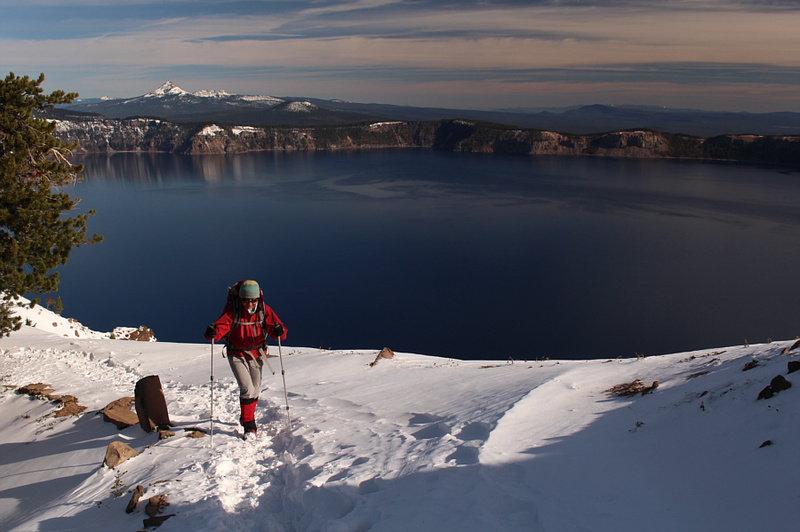 Zosia descends the snowy trail on her way back to Crater Lake Lodge.